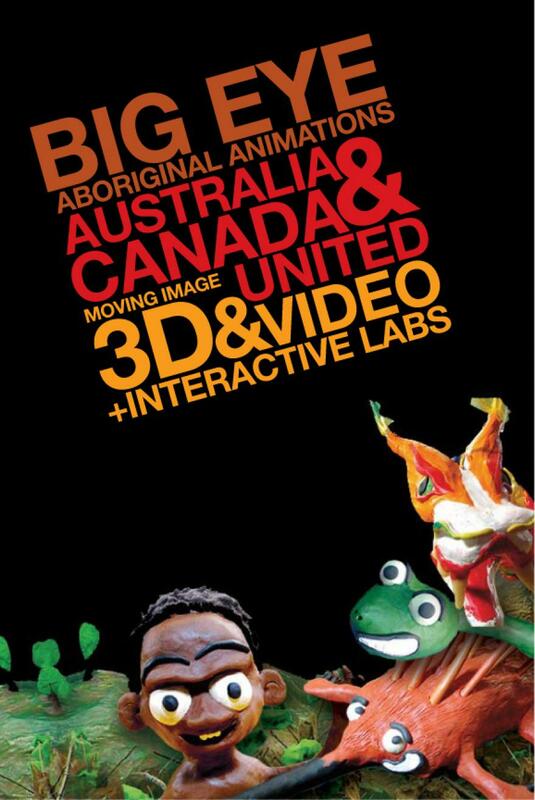 Big Eye showcases Aboriginal animations from Australia and Canada in a unique cross-tribal exchange of ideas and world views. Aboriginal Australian artists Aroha Groves, Frank McLeod & Aboriginal Nations, the Gunbalanya Community & Gozer Media, Christine Peacock, Rebekah Pitt & John Graham and artist/curator Jenny Fraser, are joined by Aboriginal Canadian artists Dark Thunder Productions, Raven Tales, Skawennati Tricia Fragnito & Abtech, Rabbit and Bear Paws, and The Healthy Aboriginal Network. Philosophically, this exhibition explores the shared heritage by Aboriginal Canadians and Aboriginal Australians through the intersection of Aboriginal aesthetics, culture, and a similar history of colonisation.